Electroporation (short for electric pore formation) is concept and methodology for the induction and enhancement of the structural membrane changes strongly increasing membrane permeability for ions and molecules such as for example DNA, usually not permeating the lipid membrane. Electroporation is thermodynamically rationalized as electric field effect in terms of a general vant Hoff relationship for the control of chemical processes by physical parameters such as temperature (thermoporation), pressure (sonoporation) and electric field (electroporation). Accordingly, the electropore distribution constant K= (P)/(C) between porous (P) and non-porous (C) membrane sites can be expressed in terms of fractional changes of the reaction of lipid clusters with water molecules to form pores. The electric field force initially acts on the dipolar and ionic head groups of the membrane lipids concomitant with the stabilization of the water in the pore wall and pore interior by the induced larger membrane field. Since all types of cells (e.g. animal, microorganisms, bacteria) can be effectively electroporated (without any chemical or viral additives), electroporation has developed into a universal methodology, a real platform technology for the modulative treatment of living cells and tissue. 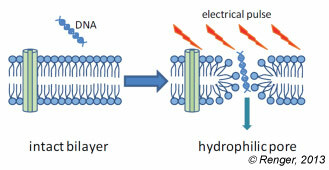 The electric pulse techniques are nowadays widely used in biotechnology and in clinical medicine; for instance, in cancer treatment of humans and animals, for (non-viral) gene transformation and reprogramming of genomes with foreign DNA, uptake of small and large RNAs for interfering with genome activities as well as in industrial processing of food and biomass and inactivation of microbes. Neumann, E., Schaefer-Ridder, M., Wang, Y. and Hofschneider, P.H. (1982), Gene transfer into mouse lyoma cells by electroporation in high electric fields, EMBO J., vol. 1, no. 7, pp. 841845. Yarmush, M.L., Golberg, A., Ser_a, G., Kotnik, T. and Miklav_i_, D. (2014), Electroporation-based technologies for medicine: principles, applications, and challenges. Annu. Rev. Biomed. Eng. 16: 295-320.